« Day 195 in Beijing: In Memoriam: Marjorie Kewley. 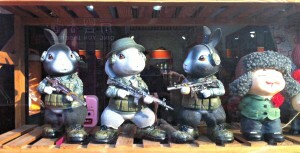 Day 196: Bunnies With Guns. These bunnies look well trained and ready for anything! I really don’t have a clue what this is about. I’m intrigued, and a bit worried, that this the sequel to Watership Down and we humans are in a lot more trouble than we suspected. Jill and I were walking around one of the Hutongs in Beijing and checking out some stores. We saw this, through a window, and were taken by it. We could have bought one but we didn’t want to support the idea of bunnies running around with guns. Heck, they are dangerous enough with their breeding habits. Just imagine if they had guns and could control the rabbit pellet feed production and distribution. We are talking about a whole new economic reality and mass confusion around the world. So, remember, kids, just say no to bunnies with guns.